Five youth went to Cedar Badge, one went to Philmont, three adults staffed Wood Badge, one attended, two staffed Venturing, two went to Philmont, two adults staffed family camp. That’s all the special things I can remember. Youth were Brendon, Seth, Justin, David,Phillip and Austin. Adults were Robin, Nancy, Harlan, Linda, Bill and Cheryl. That’s all I can remember. The Troop 6 theme this year is biking. 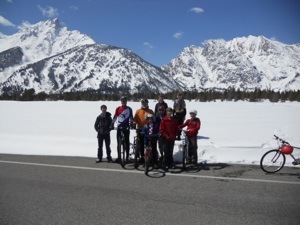 Here we are practicing in the rain during a troop meeting, followed by a great bike ride in Grand Teton National Park on April 23. (just about the only nice day in April.) When started out the temp. was 23, and 44 at the end of the ride. We did 5 hours of road for 4 hrs. of riding - 240 miles round trip, and biked 16.6 miles. Then had ice cream at Rainy Creek Store on the way home. Youth were Michael, Ben, Seth, Brendon and Wes. Adults were Elliott, Eric and Cheryl. April 2011 outing was south west of town to the Model Aircraft field where we launched rockets and did a GPS course. Then found some public GPS sites in the area. Mileage was about 20 miles, and -2C. It hailed, rained, snowed and after the rockets had all been launched, the wind started blowing. The guys played Capture the flag & Car lot till 10 that night. In attendance were Brendon, Justin, Jared, Aaron, Wesley, Matt, Doug, Ben, Taven, Seth, Talan and Michael. Adults were Eliott (a member of the club), Robin, Bob, Eric (and his young sons - David, Daniel and Jonathan), Elizabeth, and Cheryl. Ben, Michael and Brendon set the GPS course the day before. May 20, 21 & 22, Troop 6 put on a family camp for the Cubs of Pack 6, and any others who wanted to attend. It was at Krupp Scout Hollow and we had about 65 people. We were there with Wood Badge staff development, BALOO and OWLS. We had 2 campfires MC’ed by Justin, lots of activities and a service project. Talan, William and Anthony earned their Totin Chips. In attendance from Troop 6 were David, Philip, William, Aaron, Matt, Brendon, Wes, Taven, Talan, Anthony, Ben, Justin, Austin. Adults were Harlan, Tim and Moira, Bob, Lance, Robin, Bill, Elizabeth, and Cheryl. We didn’t get any degrees below or miles. The drive was just 40 miles round trip. Great trip, not much rain at all. More of a wet mist on Sunday morning that cleared up by 9. The boys did well on the ride. Talon and William both made it up and over the hill with all the other boys. Some of the boys didn’t crash on the way down. William lost a tooth, but it was ready to come out anyhow. No ice cream at Atomic City. Just beer. So Bob and I …, No actually we packed everybody up and bussed in to Blackfoot for ice cream and to top off our water jug. I just pulled more pictures off my camera. I’ll send them along also. Attached is one on the way back from Blackfoot. Do the boys look like they rode awhile? Ruth had fun. At one point she provided good instruction for boys doing penalty pushups. Attendance: Bob, Harlan, Elizabeth, Ruth, William, Justin, Wesley, Talan, Philip, David, Seth, Talan, Brendon, Doug, Michael. This year Troop 6 went to K - M Scout Ranch near Lewistown, MT. It was a 380 mile drive one way. We joined our friends from Troop 382 at the Flathead campsite. The camp was small and the scouts got some individual attention at their merit badges and advancements. The Scouts completed 37 merit badges, many partials, some advancements and one job offer - for Brendon. In attendance were Brendon, Michael, Justin, David, Doug, Philip, Seth, Taven, Conner, Sam, Talon, Jared, Joe and William. Adults were Alicia, Elizabeth, Darren, Bill and Cheryl. Troop Leader training, year planning and water sports were accomplished at the annual Ririe Reservoir outing. I think everyone had a lot of fun, the wind blew all Saturday night. Robin had his fleet out - the houseboat, cruiser with tube, a hobie cat and a canoe. The guys caught some crayfish for dinner. 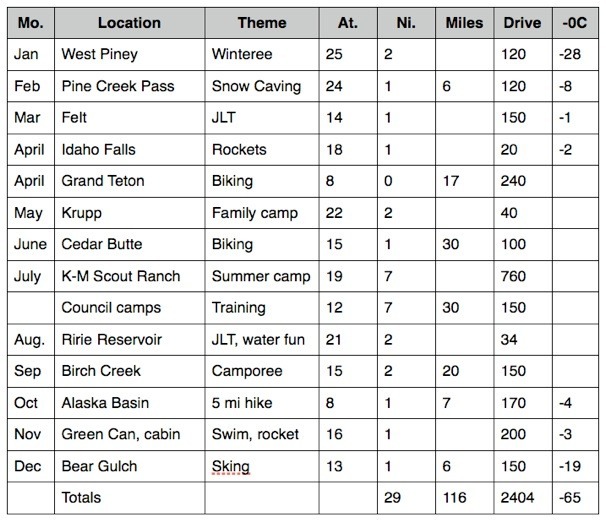 Taven earned First Class, and he and Wes did an epic one mile orienteering course. The 2011 Eagle Rock District fall camporee was held at Birch Creek along ID 28. Troop 6 participated, along with about 150 people total. It was a laid back event, the theme was fishing. Idaho Fish and Game brought some rods for the Scouts to use. After the Camporee, Troop 6 went to the Charcoal kilns and did some bike riding. Most had 2 nights of camping, some bike riding and NO degrees below yet. Cheryl taught Outdoor Leader Skills to 18 adults including Elliot and Jason from Troop 6. In attendance were: Seth, David L, Phillip, William, Taven, David P, Connor, Ben, Sam, and two more, adults were Robin, Jason, Harlan and Cheryl. It was 150 miles round trip, plus 20 more for the drive to the kilns. After a snowy Thursday, 6 scouts braved the weather for a 7 mile (round trip) hike up Alaska Basin. It was cool and the trail was pretty mushy on our way back down hill as the snow melted. However, it was a very nice day. We had a good campout that evening. We sawed a tree that had fallen over the trail, then used it for firewood. The drive was 170 miles, and we got -4 C that night. Also had ice cream at Rainey Creek store on the way back & the scouts sold Popcorn on Sunday. In attendance were Jared, David P, Ben, Sam, Connor and Bryce. Robin and Cheryl drove. November saw us doing the flag ceremony and helping with the annual Holiday Auction. Then Saturday we headed to the cabin and Green Canyon Hot Spring. The weather was snowy, blowy and cold, but the pool was hot. After the swim we returned to the cabin and had dinner, watched Airplane and slept out in the wind. Taven made his own hammock and “slept” on it. Sunday the Scouts launched their rockets with varying degrees of success. Driving was 200 miles, and we got -3 C.
In attendance were Seth, Austin, Ben, Doug, Taven, Sam, Philip, William, Joe, Michael, Bryce, David P, Owen, Cheryl, Darren, Harlan and Eliott. Also there were 6 cubs and a parent each plus some younger ones. The December outing was another ski trip to Bear Gulch. This time we made it to the lower Mesa Falls overlook, earning at least 6 miles each. The night was COLD, and everyone recorded -19C. There wasn’t enough snow to make quinzees this time. The drive was 150 miles, and included ice cream at the Frost Top in Ashton on the way home. In attendance were David L, William, Talan, Sam, Ben, Taven, Bryce, Morris and David P. Adults were Cheryl, Harlan, Jason and Chris.